William Saito speaks on best practices in the early days of building a start-up. William Saito is a Japanese-American entrepreneur, former Japanese political and strategic advisor, and cybersecurity expert. Saito has been a member of the tech world for a long time; at age 10, he landed his first internship in computer programming. Saito started his own software firm in college, out of his dorm room. This company, which eventually became I/O Software, was instrumental in the Japanese software space and developed authentication tools such as fingerprint recognition in collaboration with Sony. In 2000, at the age of 34, he sold I/O Software to Microsoft. William Saito was recognized as Ernst & Young’s Entrepreneur of the Year in 1998. 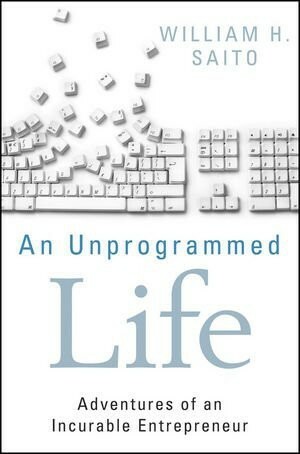 Saito’s new book, An Unprogrammed Life: Adventures of an Incurable Entrepreneur, details his early days developing his business and trying to make it in the burgeoning tech world, beginning in the 1980s. Saito grew up in Walnut, CA, just a few hours away from Silicon Valley, in a time in the 1970s and 1980s that was arguably one of the most exciting for the tech industry due to the rise of personal computing. Saito was not immune to this enthusiasm and his science teacher recommended he get a personal computer to help develop his math and science skills. Despite the fact that he is a first-generation American born to Japanese parents, he struggled to learn English growing up, in part due to his parents’ poor English skills. However, despite his poor English skills growing up, Saito has always had an engineering mind. “I’ve always liked taking things apart,” William Saito writes in An Unprogrammed Life. “I’d see a gadget, a device, a new appliance in the family living room, and I’d start wondering how it worked.” In particular, Saito details his experiences with figuring out how to break copy protection, just for fun. “Some people enjoy crossword puzzles or brain twisters, and others, like me, enjoy getting inside software to see how it works.” Saito relates that he had been working on breaking the copy-protection found in software since fifth grade; of course, around the 1980s when Saito grew up, computer software was a lot less complicated than it is today. Saito capitalized on his interest in software and programming and started his own company to create security software with some friends in college. William Saito’s passion for taking things apart to figure out how they work led to the founding of his software company, I/O Software, in 1991 as a college student. This was in the early ages of the Internet. While not quite as widespread at the time of the company’s founding, the tech world began to take off just a few short years later. One could use programs like America Online and their phone line to gain access to the internet – which was at the time rather slow but very new and exciting. Personal computing was a concept that had just recently become popular a couple of decades earlier. As Saito explains in his book, in the 1970s and early 1980s, computers had finally gone from being the massive structures that were the size of a room to being small enough to be used in one’s home. Several computer companies, including Hewlett-Packard and IBM, released compact desktop computers in the 1970s, which were convenient and powerful but cost almost $20,000. In 1976, Steve Wozniak invented the Apple I computer and suggested to Steve Jobs, the late former CEO of Apple, that they sell it. The Apple I was not as successful as the next computer designed by the Apple geeks. The Apple II was introduced a year later in 1977 and sold millions of units. In 1981, IBM entered the personal computing space and introduced their own version of what they called a “microcomputer” with an Intel processor and cost over $2,000, which was expensive but not as expensive as the computers of the 1970s. In An Unprogrammed Life, William Saito discusses his excitement when his parents purchased him an IBM computer. In an effort to boost Saito’s math and science skills, as recommended by his teachers, his parents actually took out a second mortgage on their house to purchase the computer for $5,000. Outfitted with all of the most modern technologies of the time, Saito’s new computer became his new favorite addiction. Due to Saito’s insatiable curiosity, he immediately decided to take his computer apart, which drew the ire and wrath of his parents. He then learned, as a young preteen, how to put a computer back together. This experience, though perhaps a bit scary, helped develop his interest in the inner workings of computing and software. Over the next few years, William Saito taught himself to program in the computer languages of the time, such as BASIC. As a junior in high school, he was offered an internship at Merrill Lynch, which was the premier stockbroker in the world at the time. They needed someone to write some simple computer programs to help them process some mathematical models for their stock offerings and offered to pay Saito to do so. Saito took the job and spent his Saturdays going over complicated financial calculations with the stockbrokers, who would often check his work and ask for refinements in the computer programs. This was in the early days of personal computing, so Saito would arrive at the Burbank Merrill Lynch office with a stack of paper printouts and would spend the time going over the calculations with the stockbrokers, who would check his work by hand using their financial calculators. At the time, Saito had no idea who Merrill Lynch was, or why they needed these calculations, but as Saito explains in his book, he enjoyed the project, which he worked on for about two years and used the money he made to fuel his PC addiction. Saito describes in his book that, in the 1980s and very early days of the Internet, “simply being able to connect to another individual with the same digital addiction as yourself and type messages back and forth (“chat”) until 4:00 AM was a thrill.” Of course, given the slow internet of the time, these messages were extremely primitive by today’s standards, relying on plain text rather than the streamlined messaging services of today. Users could dial in to a bulletin-board system (BBS) to talk to friends and strangers. Saito even ran his own, somewhat popular, BBS at one point. With a BBS, you could reach out to others on the network to chat with people around the world. Of course, Saito says, one had to be careful not to get too addicted or the long-distance bills for the phone line “would cost more than your father’s car.” Yikes! William Saito’s first explorations in the computing world were related to his love for BBS. He began to work out of his dorm room at the University of California, Riverside, for various Japanese companies, translating software to Japanese. A shareware program called ProComm worked with Microsoft and, in 1992, its advanced version, ProComm Plus for Windows, was the most popular software, clinching the #1 spot on PC Magazine’s list of best software. Saito and his nascent company worked with Datastorm Technologies, the company behind ProComm, on various projects. The Japanese computer company NEC, who had heard about collaborations with Datastorm, approached Saito to see if he could create software similar to ProComm for their 9801 computer. Saito had been successful in translating other software to Japanese, so he took NEC up on their offer. The work that Saito had been doing for Japanese companies was done under the name of I/O Software, Inc., although the company didn’t have an office or anything formal like that. Soon, Japanese companies started to inquire about William Saito and I/O Software and request visits to the company’s nonexistent office. Over the weekend, William Saito and his college friends went to an office supply store and bought furniture and supplies to outfit the space and make it look like an office. Because they did not have money for new office computers, Saito and friends obtained some old computers from a university computer lab. As for staff, Saito convinced his friends to show up at the “office” on Monday and to bring some female friends to pretend to be office staff and look busy. Because the visit went so well, Saito and his friends decided to continue to rent out that office and make it the company’s headquarters. Many other Japanese companies wanted to visit America and learn about their best technologies and Saito obliged. This helped the new I/O Software, Inc., with its brand-new headquarters, make waves in the software world. Throughout the remainder of his college career, despite being in an advanced pre-med program, William Saito was the CEO of I/O Software, Inc. – a rare distinction among college students. Strangely, he did not talk about it with his college friends. Saito had entered college a year early due to completing high school in just three years, so he was younger than most of his peers. “I was uncool in a number of ways, principally with the women on campus,” Saito writes in his book. “On the rare occasions when I went to dances or parties, it became obvious that I had “UNCOOL” printed on my forehead, and girls would stay clear.” Being single in college helped him save his time, money, and attention on other things, such as making I/O more successful. Because Saito was a young tech CEO, and because he was able to buy and sell computers to make some extra cash, he was able to purchase the latest technologies for his dorm room in college. This included a “state-of-the-art” PC, laser printer (in a time when most printers were the noisy and slow dot matrix printers), scanner, and fax machine, among other high-tech items. Sony liked this idea of doing fingerprint recognition and wanted to use it for office door locks, but Saito convinced them that fingerprint recognition could also be used as a security control on computers. At this time, in the 1990s, Sony had yet to enter the computer space, and they were initially reluctant because they were still primarily focused on their tech products such as televisions, radios, and, of course, the now-discontinued Sony Walkman series of cassette and DVD players. However, they soon warmed up to Saito’s idea. Once Saito was back in California, he got to work on the development for a PC-based thumbprint scanner. Although the technology existed at the time, and fingerprint scanners also existed, a software-based fingerprint scanner was an extremely novel and exciting concept in the tech world. However, conceptualizing such a scanner was a formidable challenge. Saito’s idea was to use a camera to capture the fingerprint and then develop software to be able to read and identify it. In his book, William Saito details the process of working with Sony, who had been in the hardware space, to develop this new and innovative software. The challenge in this sphere at the time was that the sheer amount of data contained in a single fingerprint made comparing fingerprints to millions or even billions of other images simply impossible. Therefore, I/O developed a way to extract the main features from the fingerprint and examine only those details, to reduce the complexity of the information contained in each individual print. This not only simplified the recognition process but made the processing time for the print much faster. The people at Sony developed a small, portable, and quiet fingerprint scanner with the I/O recognition software and, thanks to a member of the Sony team who loved dogs, the fingerprint scanner named Puppy was born. Saito’s fingerprint scanner was a massive success. Ernst and Young awarded William Saito the 1997 Entrepreneur of the Year award for this invention which paved the way for biometric data collection software, such as the thumbprint scanners used in most smartphones today. As William Saito explains, the collaboration with Sony boosted I/O’s reputation as a security company. Soon, the company had cracked every software “lock” available commercially and became experts in encryption. The success of this project ultimately led to the acquisition of I/O by Microsoft in the early 2000s. This is very informative and well described. It’s easy to understand all the points being made about William Saito. I enjoyed it a lot and will share what I learned with all my friends. Biometric software is great! Our company uses the biometric to track the employees login/logout, since then we have never had any complications with our login hours tracking. Another bilingual who loves taking things apart and then becomes a successful businessman. That’s what America is about: intercultural exchange and success. I am inspired by Saito as I am an aspiring entreprenur and he was a CEO during college which i was astonished by when i saw this. Thanks again Saito!! great inspiration.. good article.. thanks for sharing…. Surely William Saito has a profound knowledge about Biometric Software. Sounds as if Mr. Saito has utilized his strong roots in programming, and has maintained growth in many different aspects of the industry. There is a first and a last. Make software that is Biometric, into reality. Definitely going to put his book on my reading list.